What an adventure. Today I (unintentionally) came to the rescue of a coffee shop (which had better remain nameless). The problem? Espresso machine pulling shots too short (ie: not enough water running through the coffee.) It was also flashing its lights rather pathetically, hissing worryingly when it refilled and also beginning to leak hot water out of the side of the machine! Pressure and temperature dials seemed normal and there was no obvious cause of the leak. So, I tried to reprogram it to increase the volume of water going through the coffee. No joy. The espresso was just dripping out, incredibly thick and black and sludgey, and a double shot took over two minutes to pour. It tasted vile and coated the roof of your mouth like bitter tar. So I thought, maybe it’s just ground too finely. I adjusted the grind – it was very finely ground, like icing sugar, but seemed to be clumping together too. Even turning the grinder to its most coarse setting didn’t improve the espresso, so I turned it back again and ground some more in case it was a one-off blip. It was no anomaly; the second batch resulted in the grinder getting blocked as well and I had to poke the stuff out with the end of a spoon. So we decided to give the machines the benefit of the doubt, and tried to pull a shot using decaf espresso from another grinder. This shot worked perfectly!! The decaf shot was what gave it away. 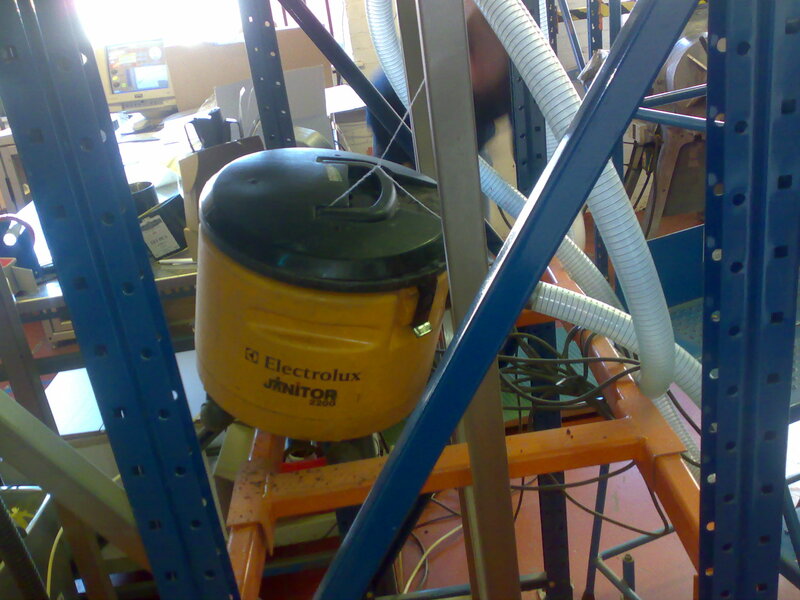 There was nothing wrong with the espresso machine, it was the coffee going in to it that was causing the problems. On closer inspection, it was roasted really, really darkly. 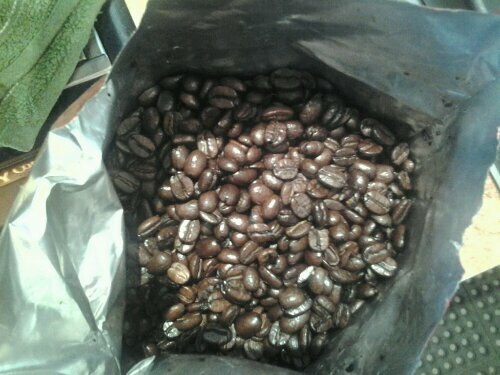 This picture doesn’t do it justice, but next to the decaf espresso, the beans looked black and very shiny. Rubbing ground coffee between my fingers felt really greasy – a sign of very low quality coffee (higher quality arabica has less oil content). The fact that it was blocking the grinder tells me exactly how greasy it was – coffee should not do that! And even very very finely ground coffee should never be so thick as to withstand the espresso machine pushing water through under 15 atmospheres of pressure. Here’s the beans. They look safe enough, don’t they? Looks can be deceptive. In the end, we just had to throw the beans away. A different blend of espresso roasted by another company but made in the same grinder and with the same espresso machine, worked fine and poured a nice shot. The roast can make A LOT of difference! Here is the bag of machine-breaking beans, just in case you were wondering. Take note of the roaster’s logo. … was absolutely exhausting. Which is my excuse for only getting round to writing about it now. Get two coffees, one “good quality”, one less so. Get as many people as possible to try them. Find out if people preferred the high quality or not. 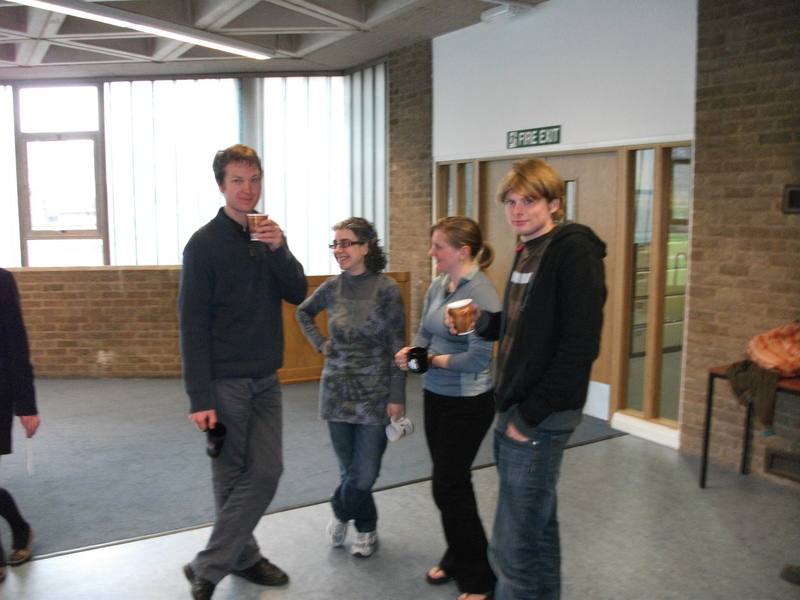 Last week, taking over what currently passes for the ‘Cafe’ on C-floor of the Geography Department, University of Sheffield. This experiment was not a full-proof design anyway, but a few things ‘distracted’ from the scientific precision, shall we say. 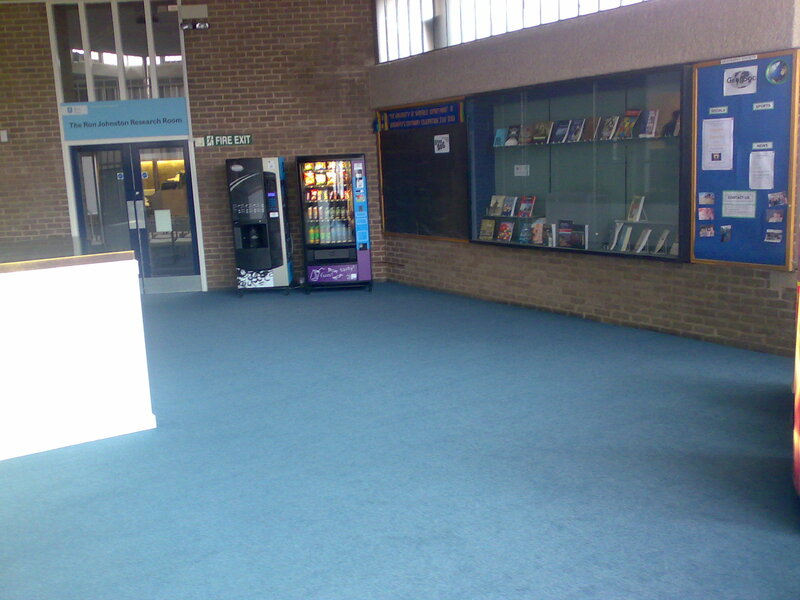 The New C floor "cafe". Ahem. The venue served us pretty well once Simon had lugged the Fraccino espresso machine up in the lift and plugged everything in. There (as yet) is no furniture in the cafe, so there was very little for our participants to sit on, let alone write out our reply slips on whilst holding two cups of coffee…. but not the end of the world. However, although I had arranged to hold the taste test on Tuesday and Wednesday several weeks ago, it was left until Monday until someone informed us that there was a department open day on the Wednesday, who also wanted to use the space. Great! I thought. More people! Sadly, no, they all appeared at 4pm, just as we were packing up. A few rather lost looking parents-of-prospective-students appeared though, looking for the department cafe… and only found us. We were of course, happy to oblige but methinks for the sake of the geography department in general, it would have been wise to build and furnish the cafe first, and then put the signs up to it…. And I can suggest someone very willing to take over the space and run it as a cafe properly, by the way... hint hint. In terms of research design, we had tried to keep the experiment as simple as possible. 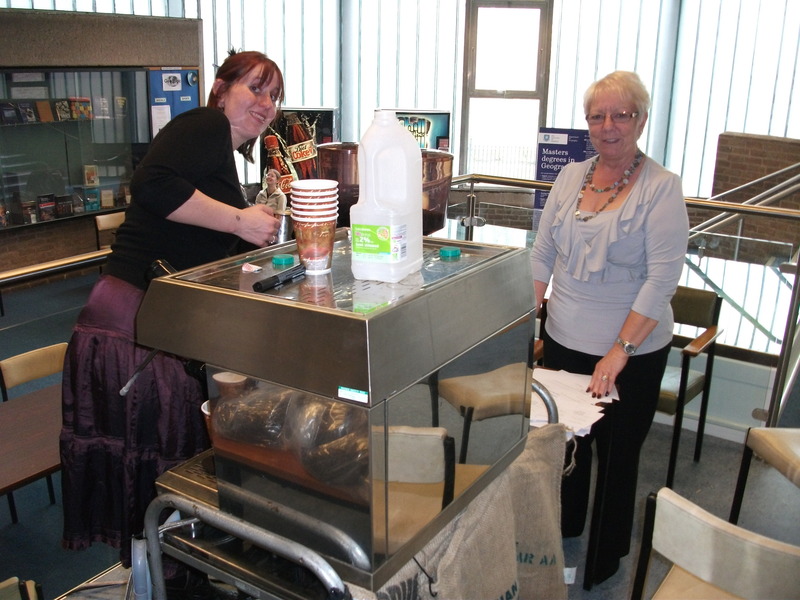 We gave our participants the sort of coffees they asked for, cappuccinos, americanos, etc. because we wanted to test the average coffee drinker, drinking what they normal would in a coffee shop. We hoped this would give a more accurate picture of how people taste coffee – the differences should still be apparent even with added milk and sugar etc. If they are not, this is still significant because it implies that it would not matter what sort of coffee goes into a cappuccino, if people are just drinking them for the milky flavours. Also, we were likely to get far more participants this way, than if we forced them all to drink espressos. However, it does leave it open to flaws in the consistancy of our drink construction though – we may well have added more milk or foamed one better than the other or screwed up the espresso at times etc etc etc. Not a highly accurate test in this sense! The biggest test for us though, was how to define ‘quality’ in the first place. A very large proportion of my whole thesis revolves around this issue! Simon helped a great deal here by basically using his knowledge of roasting and then absolving us of responsibility for defining quality. He chose three coffees for an espresso blend, that had all rated very highly on the Speciality Coffee Association of American’s cupping scale. Then, he got three more lots of beans from farms very close by to these first three, but had not been rated by the SCAA. Another factor was the price. The SCAA-rated blend would have cost £12 a kilo, the other, £3 a kilo. Was the ‘higher quality’ one really four times better? Pollards people roasted both sets of beans identically and on the same day, so there was as little variation in the roast as possible. All was set! We both did this test blind – the beans arrived in bags marked A and B, and we had two grinders, also marked similarly. We then marked all the cups before giving them to our guinea-pigs. Neither of us knew which blend was which as we made the coffees (although Simon worked it out pretty quickly! ), so we couldn’t unconsciously make one coffee better than the other and so on. This is a further issue regarding quality. Quality is not just an inherent characteristic of the green bean – it also depends on the roast and the skills of the barista (amongst other things). We could just about controi these variables, so hopefully all we were testing were the difference in quality of the beans themselves. Complicated, though! This is a fascinating result and is already causing controversy at Pollards and with Simon’s suppliers. I am not going to put the exact figures on here – I am still waiting for some responses anyway, but mainly because we want to put together a proper paper about this for academic and hopefully some trade journals. For simplicity’s sake, there was no significant difference between the number of people preferring Coffee A to Coffee B. There were a very few people who couldn’t tell the difference at all, but not nearly as many of these as I had thought there might be. If anything, there was a very very tiny skew towards a preference for A, but not enough to make definite assertations. B was the SCAA rated, high quality blend, worth four times the price of A. “The El Salvador is La Avila Estate, which came 5th in the 2009 Cup of Excellence awards with a score of 89.43. It is a fantastic cup on its own in a filter of cafetiere but is it worth 4 times more than the standard SHG from the farm next door? The Brazil was a Daterra Special reserve coming in with a score of 85.5 last year. It is the Catuai varietal and again is fantastic on its own in a filter. But again is it worth the extra? Coffee A came from neighbouring farms in El Salvador, Brazil and India, but did not have these accolades (a fact which could be used to advocate the idea of ‘terroir coffee’ and geographical indicators… but that is a whole other chapter!). And roughly half our participants (including me, to my surprise) preferred the cheaper, unrated Coffee A. Because it was such an even split, I can’t conclude that people actually prefer cheaper, supposedly lower quality coffee, because an equal number did prefer the high quality one. Judging by the comments on the day though, no-one really thought that B was worth four times as much as A. The overriding conclusion, however, is that Quality and Preference are NOT the same thing. In short, and within reasonable parameters, (ie: not mouldy, not stale, not burnt) the quality of the beans is not a real factor in coffee preference. Take away the price (a major factor for consideration amongst students! ), the marketing, the certifications and accolades on the beans, and the comfy pulls of coffee shops and their fashionable social spaces, and really, any coffee seems to be useable – and drinkable. Where does that leave the idea of “quality” amongst coffee producers and retailers then? For the producers, all the highly skilled techniques employed to enhance the quality of the green beans are not necessarily demanded by the average consumer. However, since producers do not deal directly with consumers, if the buyers and importers are still willing to pay the farmers more for what they consider to be high quality, then it is still in the interest of the farmers to keep the quality as high as possible. For retailers, however, this does appear to give businesses the perfect excuse to buy in cheaper, low quality coffees, and still sell them to consumers for the same price. Why would any coffee shop want to pay £12 a kilo for coffee, when half their customers are quite happy to drink stuff that costs just £3 per kilo? Quality in this case is very much constructed by the retailers: packaging, exoticism of the country of origin, certifications and labels, cafe branding, presentation of the drink (Simon is going to do another test looking at people’s perception of quality between coffees served with latte art and those without) – and also, price. If coffee costs more, the general assumption is that is must be better quality. Are we naive in this view? It is self-perpetuating – it is thought to be high quality because it costs more, and it costs more because people think it is high quality. I was reprimanded last week for calling the SCAA’s scale, and various certifications ‘meaningless’ in my thesis chapter. As my supervisor rightly points out, the certifications and quality assurances are not in themselves meaningless, but the meanings they actually represent are not necessarily the most obvious – or what the customer believes them to be. In this case, the SCAA scale is not actually meaningless, but instead of the ratings meaning that the El Salvadorean beans are in the top 15% of all the beans tested, it means that a handful of the self-appointed experts at the SCAA liked the taste of them enough to give the coffee a high score – and in doing so, also gave retailers and importers the leave to charge four times as much for those beans than those from a neighbouring farm. 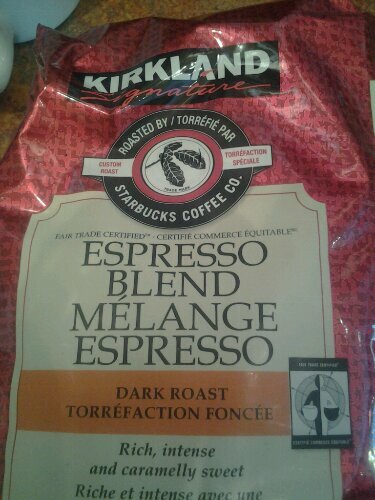 However, this is NOT a quality rating; the points simply show an SCAA taste preference. 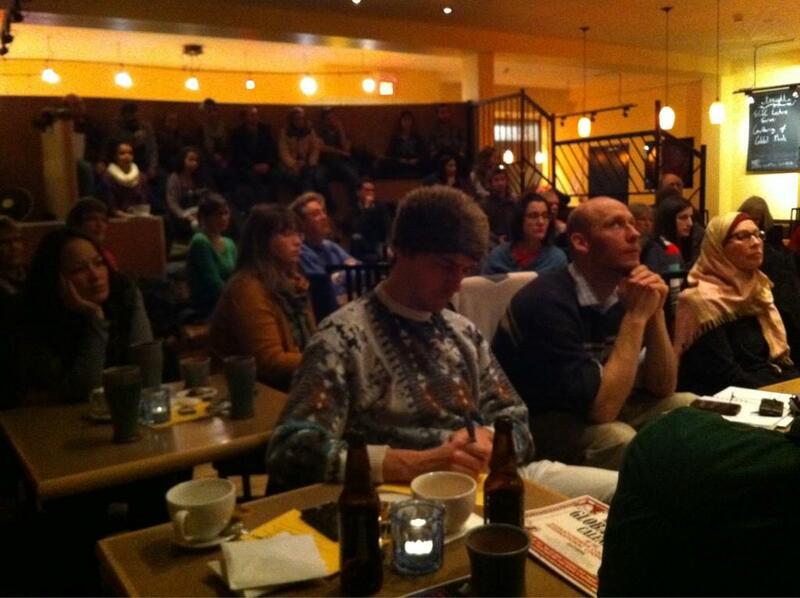 If, like half of our participants, you happen to agree with the SCAA, then that coffee will be high quality to you. If you prefer the other blend, then so be it; personal preference is, after all, personal, and as our test seemed to show, “quality” is entirely subjective as well! I am sitting in Starbucks again, contemplating the two cardboard cups in front of me. 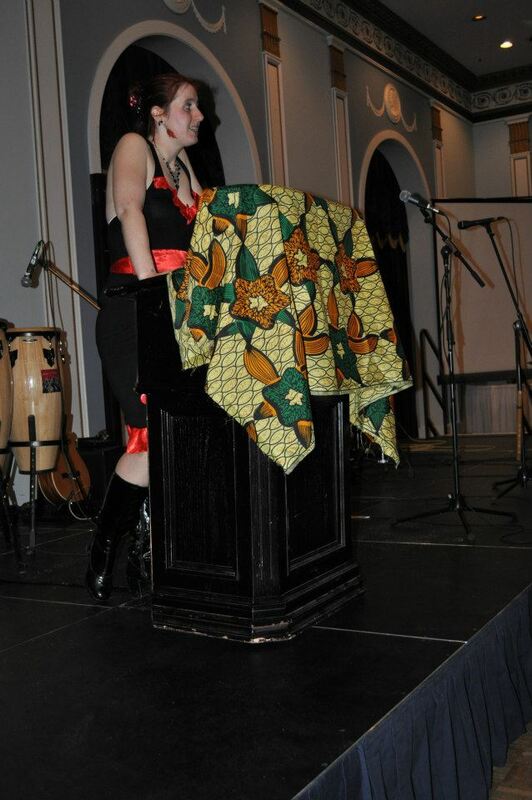 I am here wearing my metaphorical “suffering academic” hat; this is all in the name of research. Somewhere along the line I have gotten myself on the Starbucks UK mailing list, and lo and behold, I received an invite to the Starbucks Via Taste Test. They are launching their new product, called Via, which although has no mention of being “instant” coffee, comes in single-cup satchets and is completely soluable. Yep, they are figuratively – and literally – scraping the bottom of the barrel and selling instant coffee. Three sticks of the stuff will set you back £1.20 (at the introductory rate, £1.45 in a few weeks’ time. ), and I am assured it is made from “100% natural roasted arabica beans – the same high quality as all our coffee.” Now, we can “never be without great coffee” thanks to Via Ready Brew – as if I am going to carry sticks of instant “coffee” around in my bag, like tampons or something. Starbucks “believe Via tastes as delicious as our fresh filter coffee. But don’t take our word for it. Try it yourself.” they beg. The Taste Challenge involved being given two free ‘tall’ cups (that is code for ‘small’ in here, or “not-served-in-a-bucket” to everyone this side of the Atlantic). One contains their Colombian single origin filter coffee, and the other this Via stuff which is apparently made from the same Colombian beans. Could I tell the difference? Well yes, of course I could. 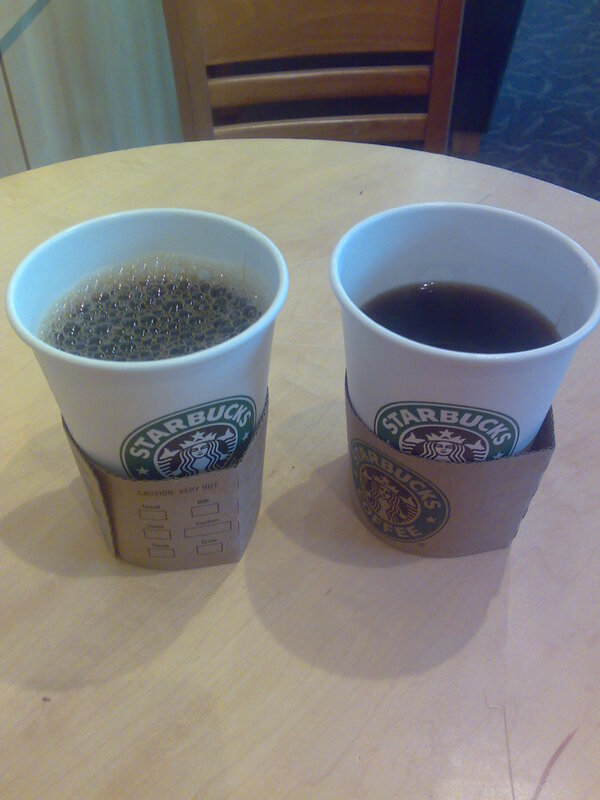 The whole ‘blind’ test idea was rendered obsolete as soon as the poor barista had to stir the soluable stuff for me, but even if I had attempted this blindfolded, the differences were immediately obvious. I can’t be sure on this, but I am fairly confident that the process employed to make coffee soluable results in the loss of any natural fragrance and aroma of the brewed drink, and certainly a great deal of the flavour. Consequently, as I mentioned in my recent rant about Nescafe, any aromas that are present in instant coffee must therefore be chemically added back in afterwards. This is exactly how Starbucks Via smells – artificial. My nose maybe going in to overdrive at the moment with pregnancy hormones, but I could smell coffee candles – that artificially sweet scent with vanilla and malt that makes up most coffee-esque air fresheners and scented candles. As it cooled, I swear I could smell powdered vegetable soup as well. Definitely not natural. On the other hand, the filter smelled extremely citrussy and mildly alcoholic, like dry white wine – to my (limited) knowledge of cupping, that implies overly acidic coffee and possibly over-fermented beans where the cherries have been left on too long. 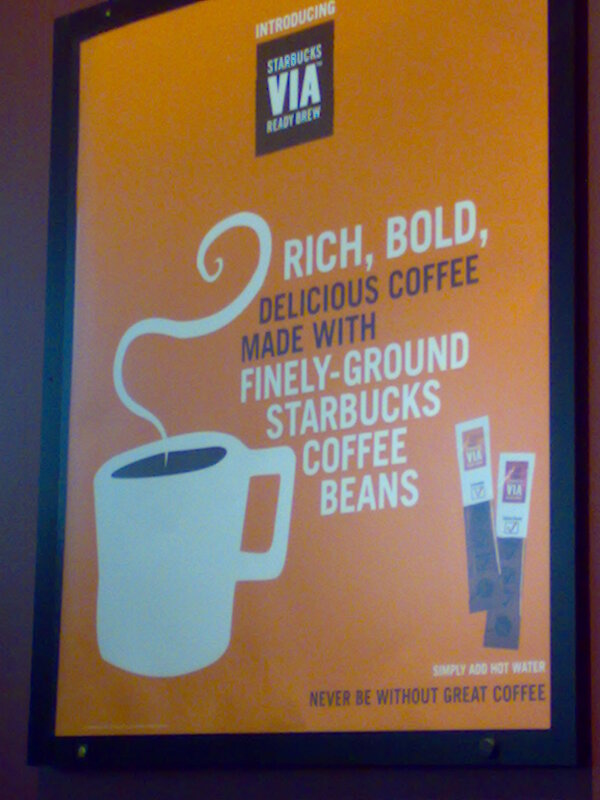 On tasting it, the Via taste liked instant coffee. There are few other ways of describing it. Flat. Smooth. Not incredibly bitter, almost waxy, if that means anything. And no aftertaste at all – it doesn’t linger in the mouth. The Colombian filter tasted very very bitter in contrast – stronger tasting all round, but with an acrid aftertaste – like the flavour you get in your mouth when you smell burning rubber. It also tasted very “thin” which to my mind, most single origins do. But the overwhelming flavour and smell was just BURNT. In my opinion, Starbucks burn their coffee anyway – that is the way they can guarantee the same flavour in every batch of coffee in every shop in the world. They bake the coffee to effectively flatten any nuances in the beans, to keep the flavours consistant. But even so, the filter was especially burnt – the roast was far, far too dark for filter coffee. I have to admit I am now feeling bad about not liking this. Whatever else I can say about this place, the staff are lovely and I kinda feel obliged to enjoy my Third Place experience, or something….Yes, I am weak. One barista has just said she can’t tell the difference between the Via and the filter!!! I am keenly following other people’s views on this on the Starbucks Facebook page too. There are many, already, who “failed” the taste challenge, and couldn’t tell the difference. This actually frightens me. However, after experiences in Sheffield over the past few days, I am now rekindling my interest in what non-coffee-geek people actually think. I have always tried to avoid customers’ opinions throughout my PhD research because they are just messy, most of the time, and so much has been written on coffee shop culture already. Yet, if I am going to look at ideas of quality, I need to find out if that quality is recognised, appreciated and demanded by consumers. The basic premise of my thesis was that in order to produce high quality coffee, more has to be wasted in the process. But if customers do not actually recognise ‘quality’ and don’t necessarily demand it, then the waste cannot be justified and the extra effort that goes into improving the quality is also wasted. And then we are back to my (now infamous) question at the Ohio conference: Why not let them drink crap if they want to? Yesterday, I was lucky enough to get invited to see Pollards coffee roasters in Sheffield (actually thanks to a throw-away comment on this blog! yay!). 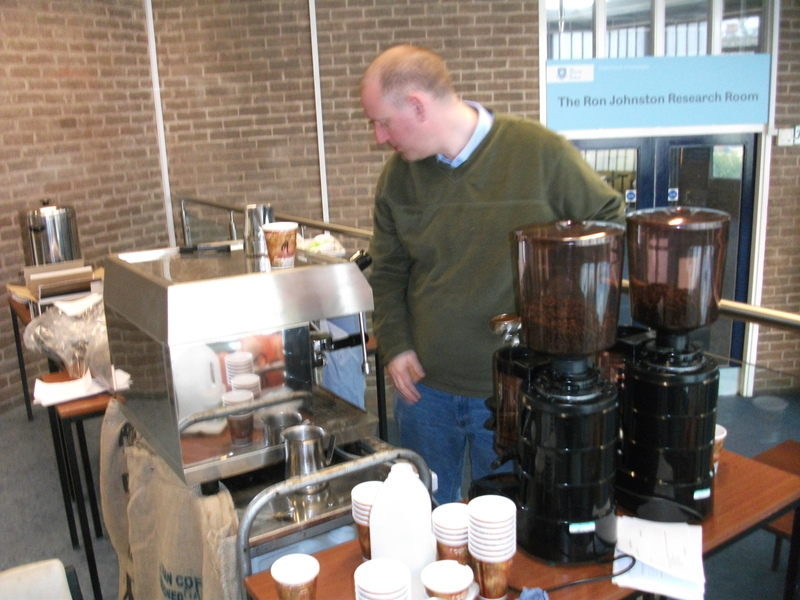 Simon, the owner, seems to be a kindred spirit – ie: equally cynical about many aspects of the coffee industry and proved very very interesting to talk to. The roasting is done on a very hands-on basis still, using roasting machines which are “partially” computer controlled. The computer monitored the time, temperature and energy consumption of the roasting beans, and the roast profile for that particular batch was neatly plotted on a graph on the screen in a neat curve. As the beans roasted, the computer plotted another line showing the actual temperatures of the beans – it was pretty close, although with a few extra wobbles – thanks to the proportion of the blend that came from Honduras, apparently. I asked Simon how he had learned to roast, and all the intricacies that go with it (he had also designed a roaster machine that could potentially run off vegetable oil, and made an ingenious contraption out of plastic piping and a hoover to move the roasted beans around the workshop without breaking any – and saved himself £25,000 in the process). He said most of his knowledge was as a result of his physics degree!! NOW I know where I’ve been going wrong, messing around with arts and social sciences for all these years…..
On the subject of academic research, however, Simon is very keen to do the Quality Test. That is, to get a goodly sized sample of coffee drinkers together, and do a taste challenge a la Starbucks, only offering one very high quality coffee and one low quality (based on price of the beans involved from origin – he will do the roasting and it’ll all be espresso based.). Basically, we want people to tell us which one tastes better to them. This should tell us once and for all, if your average coffee consumer actually notices and prefers “high quality”. This could be EXTREMELY handy for me too – not just for my research, but also for the Doc Coffee van. All being well, I could print posters like Costa’s – 80% of people prefer high quality (Costa advertise the fact 7 out of 10 “coffee lovers” prefer Costa. Tested on 174 people. In Glasgow.). And if the cheaper blend is preferred, I shall jack it all in and buy up loads of Starbucks Via for the van…. ye gads I hope not!!! To this end, I am planning on getting something together at the uni – I’ll hire a room there, Pollards will supply the coffees and the espresso machine, I can bring cups and round up coffee drinking students and university staff. We’ll do this over two days, and it would be great to get over 100 people. I’ll be plugging this as much as possible when we’ve decided a time so if you’re at all interested and fancy a couple of free coffees then pleeeeeeeeeease get in touch, come along, and give us your opinions! On that note, if you’ve done the Starbucks Via Taste Challenge, PLEASE give your views on here! I’d be really interested to hear from you. Thanks all!